I wanted to share an e-design project with you all which should be done in a few weeks. The client is just waiting on the furniture pieces to arrive. A lot of people ask how my e-design services work, for the details read here, but in summary, a client sends me snapshots of the room the be designed and the detailed measurements first. Then I ask them for inspirational photos and to answer a series of detailed questions. Before the design process begins, we have a phone interview and then I start throwing out basic concepts. Once we find a starting point, either with a fabric, piece of artwork, rug or inspirational room I start developing a concept. 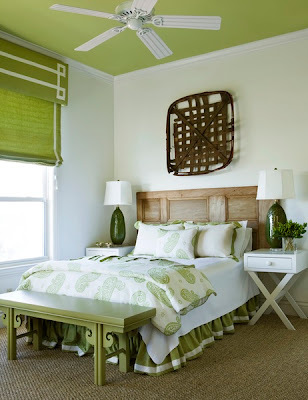 In a few weeks the client receives a binder with a suggested layout, inspirational design, fabric, paint swatches, and guide on where to purchase the items for the room. And coming soon will be the finished product....stay tuned in a month! Great inspiration board! Can't wait to see what you pick for a glider! 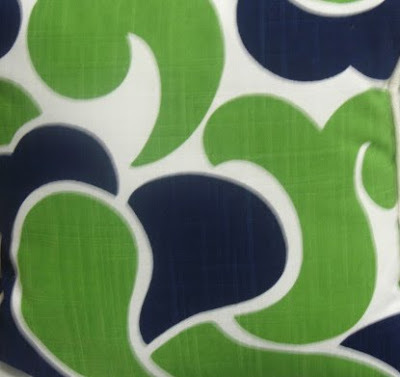 Oh my goodness - any chance you would identify the navy and green swirl fabric? 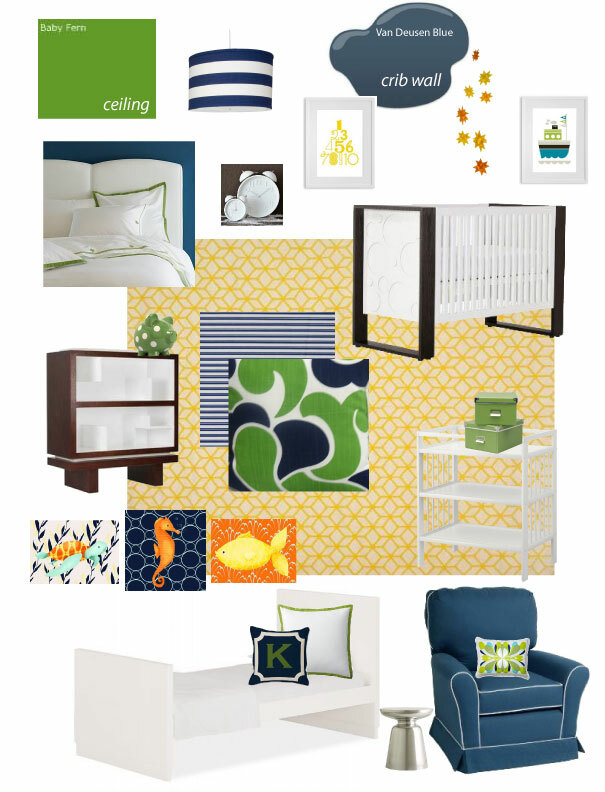 I had that exact fabric picked out as the inspiration for my baby boy's nursery and just found out last week that my local fabric store has sold out (someone bought all 30 yards!) and could not source it for me. Pregnant lady meltdown ensued. I would be most grateful if you could help! This room is going to be amazing!! Oh Wow! Love this! Are you painting the whole room the dark blue or just the accent wall? I can't wait to see the final product as I am loving this theme! 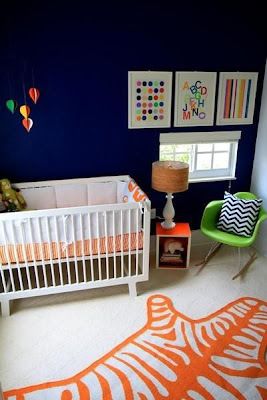 So, I'm dying to see what this nursery looks like. Can you post some updated pictures?!?!?! I'm also trying to track down this fabric. It is an awesome starting point! Would you be able to tell me where to find it? Love this! Would love to know where the pendant light is from. Thanks!